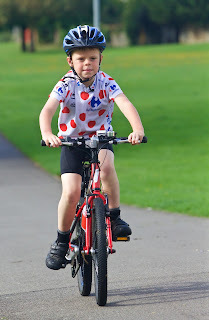 A rather sad day for the Family ByCycle today as Thomas Ivor left us for the impending school term. He'll be back in three weeks for a visit. The good news is that 'Desert Storm' - the second-hand Islabikes 'Beinn 20' we picked up for him the other day, has gone with him, so he now has the means to keep riding whilst he's in Devon. We've kitted the bike out to a rather different spec, dispensing with racks and guards for now, fitting the OE knobbly tyres at lower pressures, a toolkit and basic computer from Aldi - oh, and the obligatory colour co-ordinated Islabikes bottle! After the washout of a bank holiday, which put paid to us having the couple of days touring that we'd hoped for, we were able to head out to the park this morning to start filming our review of the 'Beinn', which can now include some comparison between pre- and post-2012 models, and show the bike in different incarnations - colours, accessories and the like. It will fall to me to do most of the filming now, and then hopefully we can get a script written between us so Thomas Ivor can do some 'voice over' work next time we see him. We hope that we will be able to persuade more parents (and children!) 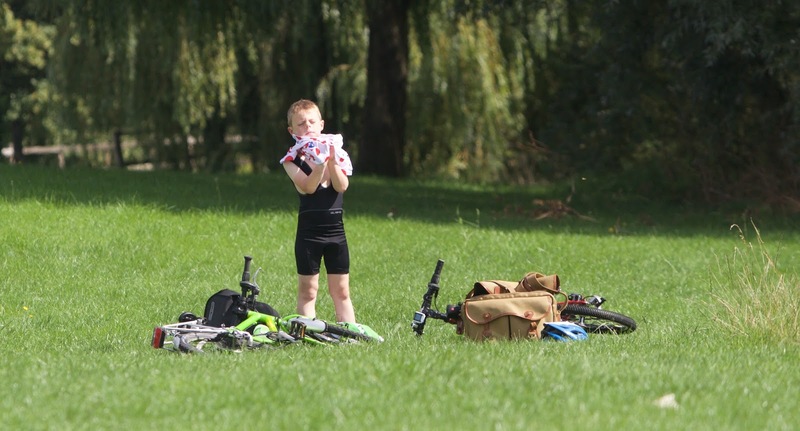 of the value of a properly-sized, lightweight bike, in helping youngsters to get riding more proficiently at a younger age, with fewer of the distractions and hindrances all too commonly experienced. The little guy had his first try at using a lavalier microphone today, which complicated the costume changes a little, and we had an incident with a flat battery, but we're gradually getting there with our new video production setup. GCN, eat your heart out! As Thomas Ivor has departed, the girls have been out of sorts today, but with more good weather I'm hoping to have them both out on the balance bike again before long. Meantime, it's galettes for tea tonight. Fourth night running!